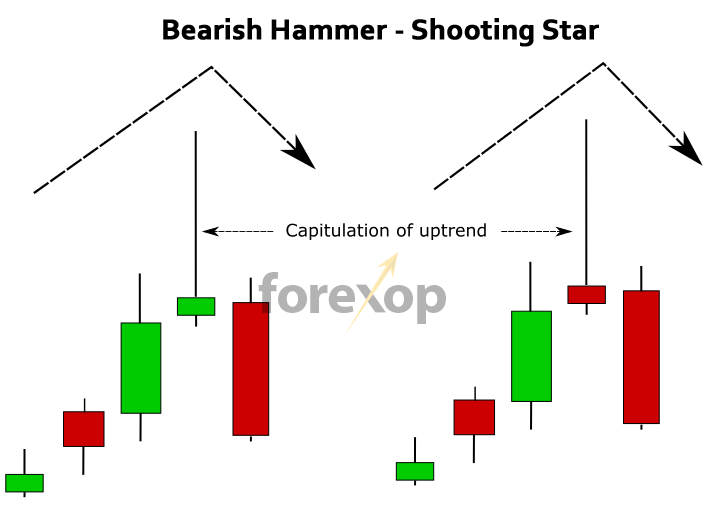 Intelligently detects hammer candle formations in any chart as well as doji patterns, shooting stars, hanging men. Auto alerts you in time to do the trade and filters false signals. 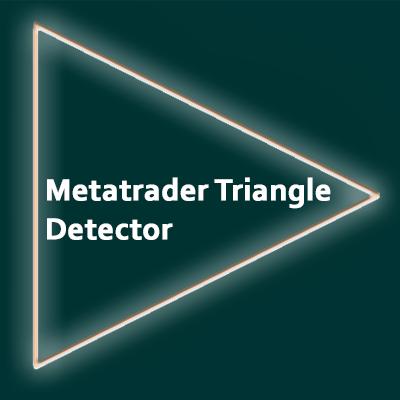 This Metatrader indicator will scan the chart for hammers, inverted hammers, doji, hanging men and shooting star candlestick patterns. 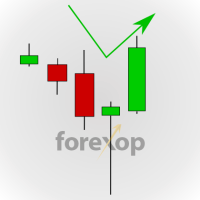 It will alert you on detecting any potentially bearish or bullish reversals. The settings let you to filter out the weaker or less clear cut cases to leave behind the strongest trading signals. 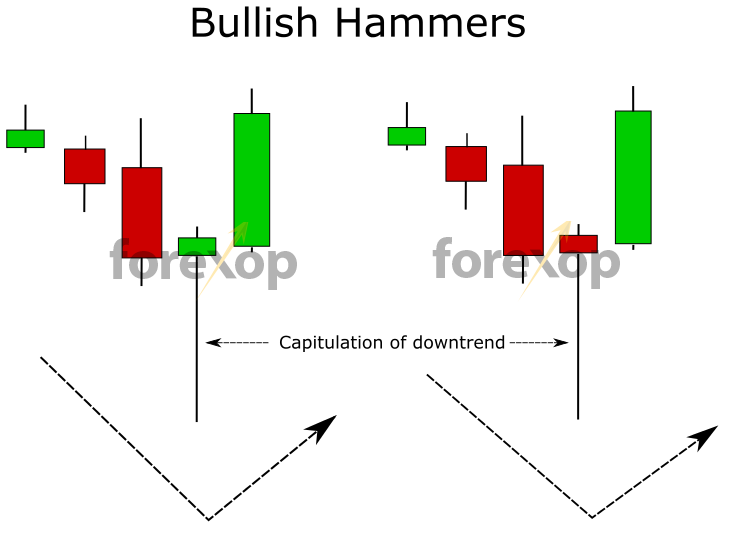 A standard hammer candlestick forms where the price makes a deep low and then makes a rapid recovery. This “recovery” is the key property that makes hammers useful for detecting price reversals. The recovery can either take the price back above the open level or just below the open. 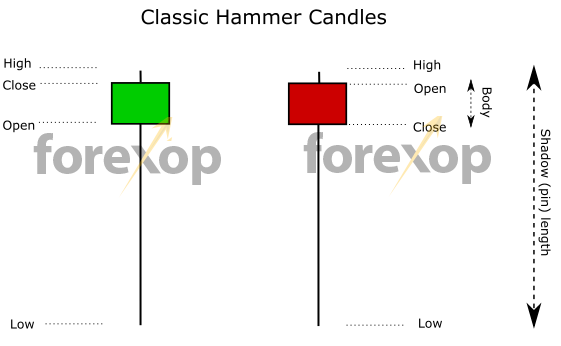 In these cases as depicted in Figure 1, the resulting candles will appear on the chart as either a green hammer or a red hammer. The shadow (or pin) length is a measure of how deep the price fell before recovering. A longer shadow indicates a deeper fall and a stronger the recovery. A longer shadow suggests there could be a stronger breakout. This is because it suggests that more of the bulls (“longs”) have been forced out of the market at lower levels. Hammers usually form as a bearish trend enters its final phase. They are conventionally a bullish signal. An inverted hammer is also a bullish signal and looks like an upside down hammer with the shadow pointin upwards. When this pattern forms in an uptrend it’s called a shooting star and is a bearish signal. Shooting stars usually form as a bullish trend is topping and the market prepares for a downturn. Shooting stars occurring in upwards trends are therefore taken as bearish signals. Hammers sometimes appear as downtrends exhaust themselves as the balance moves from the bears back to the bulls. The key points to look for in a hammer are the shadow length and the body position. The shadow length: The length of the shadow tells how far the market fell before it capitulated. The capitulation is usually a very rapid event where market sentiment flips. Capitulations happen when those on the wrong side of the trend (buyers in this case) give up their positions and flood the market with sell orders. This wave of sell orders is often driven by a cascade of stop losses. The result is that it pushes the price down rapidly and draws in new buyers who enter at more favorable levels. This provides the market with a fresh wave of upward impetus and momentum that enable it to break new highs. The candle body has two important properties: The body length and the position of the body within the shadow. The body length: A classic hammer candle has a short body in relation to the shadow. The shadow should be at least twice the body length. For a strong hammer, the shadow should be at least three times the length of the body. Some traders prefer stronger ratios such as 5x or even 10x the body length. But this also depends on the body size because sometimes (as in the case of doji) the body length is zero or close to zero. The body position: The candle body position with respect to the shadow will give an indication on the direction the market was taking and which side was strongest. With a classic hammer the body is positioned at the very top end of the shadow. This shows that a strong rebound was underway at the time the candle was forming and successfully brought the level back up to (or above) the open. When the body is more central along the shadow the hammer signal is less clear. A candle with a central and very narrow body is called a doji. A central body indicates there was strength on both sides and that either a) the capitulation failed to inspire enough buying to maintain any new highs. In this case the price fell back towards the open level. Or b) in the reverse case the price rallied initially but the higher levels triggered more selling which resulted in the price breaking lower again. In both cases the signal is unclear. In this case it’s best to examine the lower time frames to understand the market dynamics. Some traders will treat any hammer with a narrow body as a doji. The position of the body is usually more important than the body size itself or its color. The equivalent to the hammer, which appears in a rising market is known as a shooting star. These are identical to the hammer, just the other way around. The market dynamics are the same but in reverse as the trend is rising. These are bearish signals. Some typical patterns are shown in Figure 5. 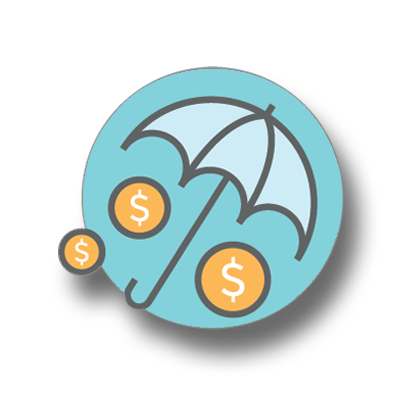 When trading hammer signals there are a few special cases that need to be prepared for. 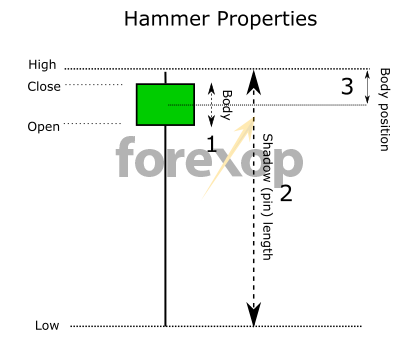 The doji as shown in Figure 6 on the left indicates that the market is indecisive. When this candle appears it can be a sign that the existing trend has further to run. In this case it’s many traders wait for the next candle to check if the market really is gaining strength in the new direction. It could simply be that the trend is pausing and further downside pressure is developing. The doji can be a slightly bearish signal in a downtrend. This because of the fact that as the market broke new highs it brought in more selling rather than buying. 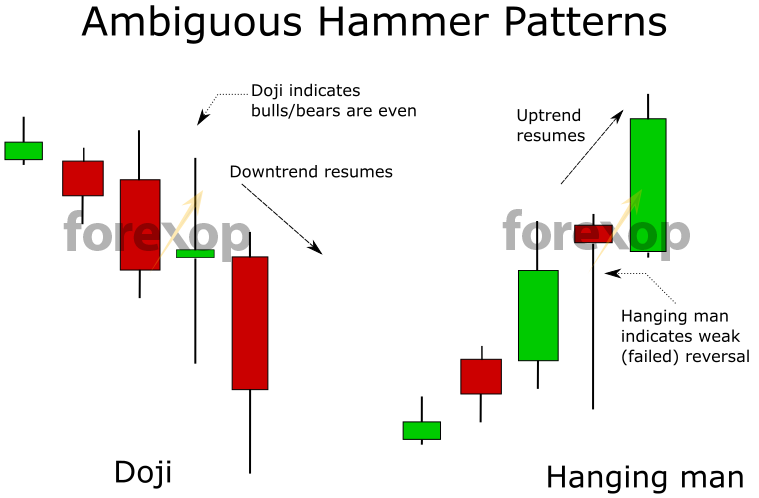 The doji often happens where a reversal was premature or too weak to push the market upwards. The only difference between a hanging man and a hammer is the position within the trend. They are the same in appearance so it is necessary to examine the preceding bars and the trend to determine the market sentiment. The hanging man happens when a bullish trend reverses temporarily and then recovers. These can form as the market digests a new piece of fundamental data – an economic release for example. The “hanging man” marks a sudden increase in selling which later recovers. Hanging men are bearish reversal signals but can also be continuation signals. For more information see the Japanese candlestick guide.